This page is an older version of the new Xilinx JTAG Linux. If you are running Ubuntu 11.04 (or newer) or Xilinx ISE 13.2 (or newer), then check out the new tutorial page, Xilinx JTAG Linux. If you found this information helpful, you can Donate a small sum of money (of your choosing) to help me get through my degree and for the upkeep of this server. Finally, I am no expert in any of this: FPGAs, Xilinx or Linux. I just applied what knowledge I did have, and made it work. I offer my experience as help to you. You may contact me here. This Install Guide refers to Ubuntu 9.10 (Karmic Koala) 64-bit Desktop Edition. Download Xilinx ISE from their website. This guide assumes you have Xilinx_11.1_ISE_DS_SFD, which is the full version, and not the webpack. However, the webpack should work in the same manor. Accept the License Agreement, once again. Except the default install path of /opt/Xilinx/11.1 – Feel free to change this, but the rest of this guide assumes you have left this. Select what you wish to be installed. I chose ISE Design Suite Product including the Design Tools, PlanAhead, DSP Tools, Embedded Dev Kit, ChipScope Pro. Next when you are ready. Select the ISE Design Tools. I left everything checked: Design Enviroment Tools, WebPack Devices, Foundation/Edition Devices. Keep all the suggested paths. You next have to select the last few installation options. Check Aquire/Manage a License Key. 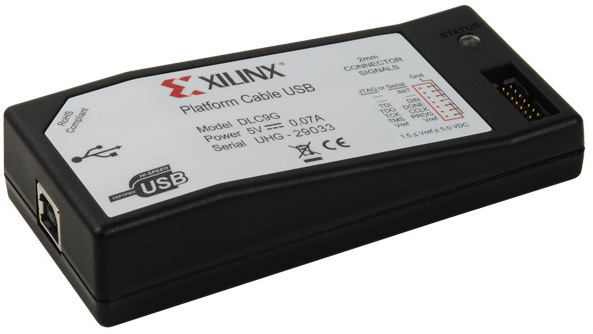 Uncheck Install cable drivers (does not work, use the method outlined below) and Launch XilinxUpdate – This is a minor detail, and can be done later. Review the options summary. Here is mine. Yours will look different based on Distro, and your options. This step is once simple command, but the most important. Firstly change into the source directory created in the previous step. Then you need to issue the make command. This step is not needed for versions of Xilinx ISE newer than 10.1: LD_PRELOAD instructs the loader to load additional libraries into a program, beyond what was specified when it was compiled. It allows us to load the USB CableDriver into iMPACT without recompiling it (which we clearly cannot do). udev is the device manager for the Linux 2.6 kernel series. Primarily, it manages device nodes and hotpluging, which means that it handles the adding/removing devices, including firmware loading. This is what we are required to do. The Xilinx Programmer doesn’t have any firmware, and so we need to tell the computer that when we plug in the programmer, that it should attempt to load the correct firmware to it. fxload should do this for us. Fortunately all of the complex stuff comes with the driver source downloaded previously. All we need to do is put it in the places the computer expects it. Then we need to restart udev, so it sees the new configurations. Once you get to here, the cable drivers should work. When you plug the programmer in, you will notice that after a short while, the programmer’s status LED turns green. This indicates that the firmware was successfully loaded. 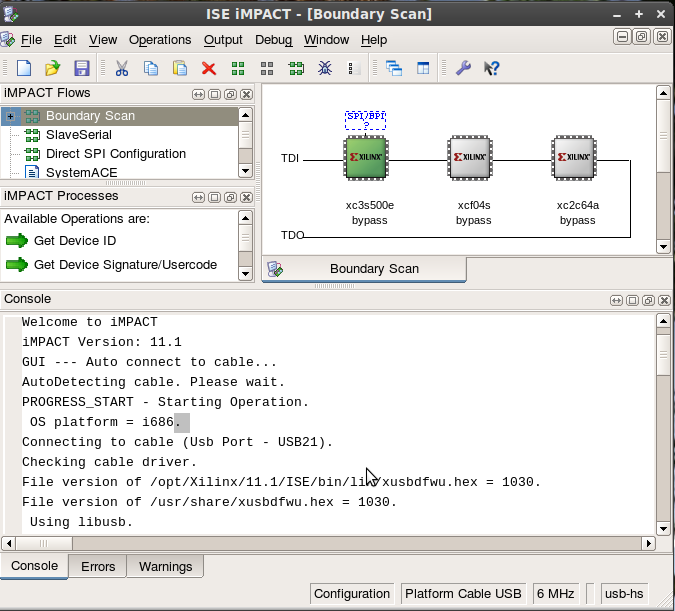 If you open Xilinx’s iMPACT with the programmer connected to the computer and a circuit, you should be able to execute a boundary scan. The image below shows Xilinx iMPACT running under Linux Mint 7 (Gloria) with a Boundary Scan of my Spartan-3E board. This is the result of a boundary scan on my Spartan-3E board. Connecting to cable (Usb Port – USB21). File version of /opt/Xilinx/11.1/ISE/bin/lin/xusbdfwu.hex = 1030. File version of /usr/share/xusbdfwu.hex = 1030. File version of /opt/Xilinx/11.1/ISE/data/xusb_xlp.hex = 1303. INFO:iMPACT:501 – ‘1’: Added Device xc2c64a successfully. INFO:iMPACT:501 – ‘1’: Added Device xcf04s successfully. INFO:iMPACT:501 – ‘1’: Added Device xc3s500e successfully. Below shows the the linux kernel reporting that it finds the device. Notice that it finds the device 3 times. It finds the chip with no firmware, then once it recognises it, it uploads firmware, and then it restarts. It finds the chip with the firmware, initilises it, and then restarts the chip. You should see this. If you do it all correctly, once the kernel has settled, you should get the status led illuminated. 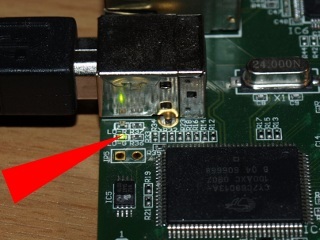 This will either be the LED on the front of the JTAG box, or on the Spartan-3E board, the status LED next to the USB-B socket (shown with the red arrow). Thying to make a perfect guide for many different possible combinations is hard. Here is a section of things to try before you dispondantly email me. ::Thanks to Mehmet Tukel, Teaching Assistant at Istanbul Technical University for this source. ::Thanks to Werner Hein for this source. ::Thanks to Jonathan Drolet for this source. [29/Jul/2011] Added ia32-libs-dev to dependancies on 64-bit systems. (Thanks to Philipp HÃ¶rauf). [05/Feb/2010] Adjusted the dependencies, seperating 32/64-bit hosts. (Thanks to Jerry G. for pointing this confusion out). [15/Apr/2010] Added information for Ubuntu 10.04.